The New York Public Library’s famous A.G. Spalding Baseball Collection houses some of the rarest documents and images from the history of our National Pastime. 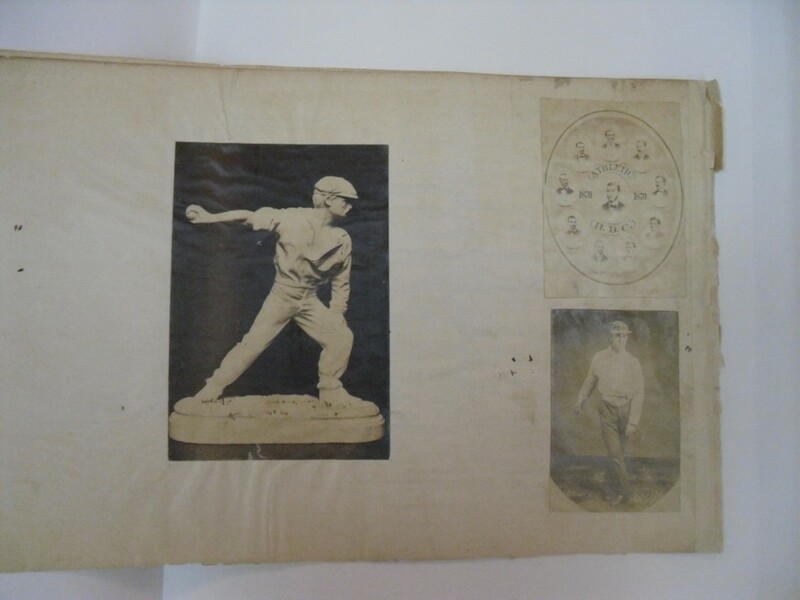 Compiled by baseball pioneers A.G. Spalding, Harry Wright and Henry Chadwick, the collection boasts the most comprehensive archive of early nineteenth century artifacts including the original club books of the Knickerbocker Base Ball Club and unique photographs of some of the earliest baseball teams and figures. The collection was donated to the library in 1921 by the widow of A.G. Spalding and in 1922 a detailed inventory of the collection was published in the Bulletin of the New York Public Library. The inventory listed each individual photograph in the collection as well as every book, pamphlet, scrapbook and score-book, however, it was nearly impossible to inventory all of the treasures tucked away and pasted onto the pages of the many scrapbooks and score-books in the collection. In 1983, historian John Thorn spearheaded an effort to microfilm most all of the fragile scrapbooks and score-books found in the Spalding Collection. Thanks to that endeavor, baseball researchers have since had unfettered access to the valuable information found in the Spalding scrapbooks, Knickerbocker Club-Books and other treasures. Most of the gems in the collection at that time were captured on microfilm, however, at some point, the library put aside various loose pages from the scrapbooks and score-books that featured photographic materials affixed to them. Those pages and images were never documented on the microfilm. One such page, features the rarest and most important image of nineteenth century baseball photography, a carte-de-visite size albumen photograph of Brooklyn Excelsior pitcher, James Creighton. I first became aware of the NYPL’s Creighton image almost a decade ago when I saw a photocopy of the image in a box along with other items in the Spalding photograph collection. But it wasn’t until last year that I discovered the original, thanks to NYPL’s Manuscript Head William Stingone and his colleague Thomas Lannon. 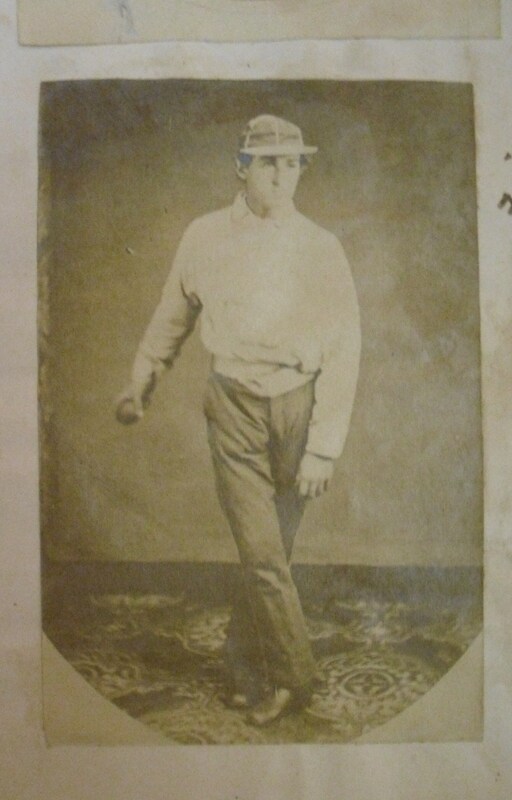 Stashed away in an archival storage box were several loose pages from a c.1870 score-book of baseball pioneer Henry Chadwick, and one of those pages featured the rare image of Creighton. Last week, Thorn’s recollection from his new book became the topic of discussion on the internet collector forum, Net54, as the current owner of the “Culver Creighton” and other members tried to determine what year the card was created and whether the card was originally produced as a trade card for the nineteenth century sporting goods outfit, Peck & Snyder. The company issued trade cards featuring advertisements and photographs of teams including the 1869 Cincinnati Red Stockings, the 1868 Brooklyn Atlantics and the 1870 New York Mutuals. Corey Shanus, the owner of the card, first posted information stating his belief that the biographical information on the back of the card was part of the original card’s backing, but other collectors questioned whether it was pasted or glued onto the reverse. Shanus posted a black and white scan from a photocopy of the back for discussion on the forum. The "Culver Creighton" was pictured in the 2005 book "Smithsonian Baseball" (left). The reverse scan of the card from 1983 (courtesy of John Thorn) exhibits damage and paper loss. It also bears the inscription, "Return to Culver Service-Valuable Print." As to the date of the card, collector Jay Miller theorized it was from after 1870, since the address of Peck & Snyder on the reverse of the card bore the address of “126 Nassau St.” Miller stated that the company moved to that address in 1870. John Thorn’s observation that the card appeared to have been removed from a scrapbook adds another layer of mystery to the “Culver Creighton.” Last year, a Culver representative, Eva Tucholka, revealed to us that in the past Culver Pictures regularly received photos on loan from the New York Public Library. Tucholka also confirmed that it was possible some loaned photos from the NYPL were never returned. Likewise, she also confirmed instances where Culver loaned photos to the NYPL and that some of those were never returned to Culver either. 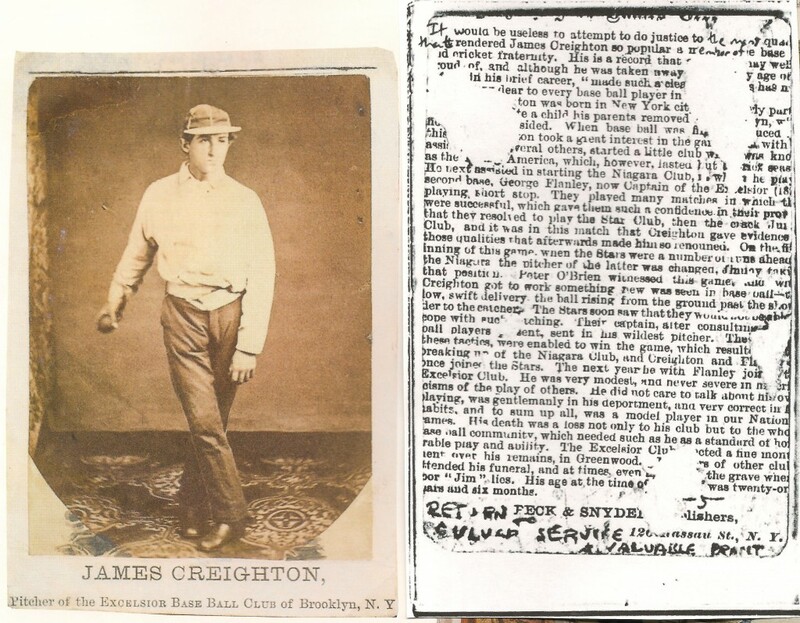 At the time I witnessed the NYPL’s Creighton image from the Chadwick score-book, I also discovered that one of Chadwick’s period scrapbooks, featuring a page with a large wood-cut of Creighton and the Excelsiors, showed evidence of the removal of a section of that scrapbook page appearing to be the same size as the “Creighton Culver” card. 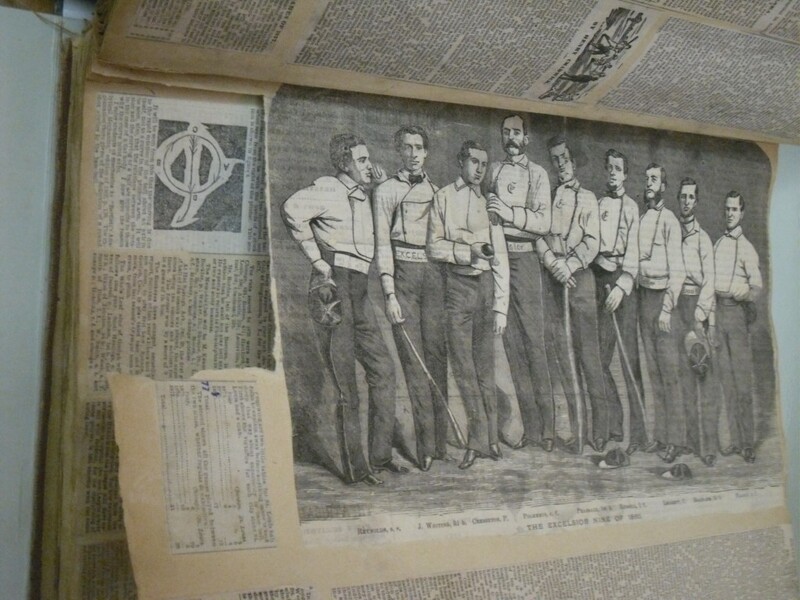 The wood-cut image of Creighton and the team on that page was published by the New York Clipper in September of 1875, a few months before the Excelsior’s twenty-first anniversary dinner. The scrapbooks at the NYPL show additional evidence of thefts and removals and three large scrapbook volumes featuring the incoming correspondence of pioneer Harry Wright actually went missing from the library sometime in the mid-1970s. Those thefts, and the disappearance of hundreds of photographs from the Spalding Collection are currently the subject of an on-going FBI investigation. The value of the missing items is well in excess of $2 million. Corey Shanus, the current owner of the “Culver Creighton,” has been linked to the FBI probe of the NYPL thefts as a result of his ownership and public display of several items confirmed stolen from the Spalding Collection. In the 2005 book, Smithsonian Baseball, Shanus displayed two rare nineteenth century ”Challange Letters” sent to the pioneer Knickerbocker Base Ball Club, that have both been confirmed as stolen from the NYPL’s Knickerbocker Club Scrapbooks (which were never microfilmed.) One letter Shanus displayed in the Smithsonian book was written by Brooklyn’s Star Base Ball Club in 1860, and another was written by Creighton’s Excelsiors in 1860, as well. Both letters in Shanus’ collection have been sliced out of the NYPL scrapbooks with a sharp object, however, in both instances, part of each letter, with identifying marks and notations, were left pasted onto the NYPL scrapbook pages. Shanus’ collection also features score-sheets which have been stolen from Henry Chadwick’s score-book volume from 1858-59. It is not known if the stolen NYPL items in the Shanus collection have been seized by the FBI as a result of their on-going investigation. Leiderman has been following the FBI’s on-going investigation into the NYPL thefts, but is skeptical about the results. “I’m not holding my breath waiting for the NYPL and the FBI to take action on this matter. Hope they prove me wrong and do what is right this time around,” said Leiderman. The “Culver Creighton” was never documented on the original 1922 inventory of the Spalding Collection published by the NYPL, but neither was the other photo of Creighton discovered pasted in Chadwick’s scrapbook. 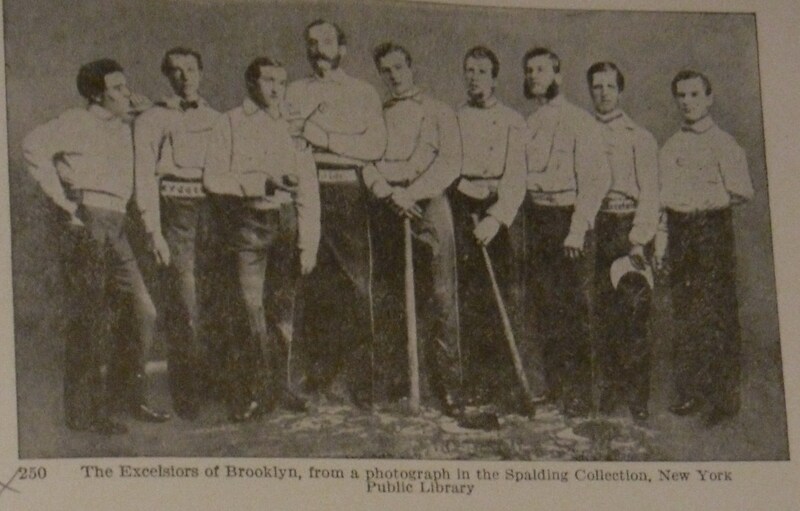 Adding to the intrigue is another mystery regarding a team photo of the 1860 Brooklyn Excelsiors, featuring Creighton. That rare and valuable photo was listed on the NYPL’s original inventory and is currently missing. The inventory lists two Excelsior team photos in the collection, but only one over-sized, mammoth, salt-print has survived. The NYPL's surviving mammoth salt-print of the 1860 Excelsiors was illustrated in the 1960 book, "Baseball: The Early Years." The second copy of the 1860 Brooklyn Excelsiors appeared in a 1920s book series called the "Pageant of America," with a credit to the Spalding Collection of the NYPL. Luckily, in the 1920’s, the missing Excelsior photo was photographed for use in a book series called the Pageant of America, and a silver gelatin print of the original (retouched with wash) is still located at the NYPL to document its inclusion in the collection. This same picture appears to have also been reproduced in A.G. Spalding’s 1911 book America’s National Game. 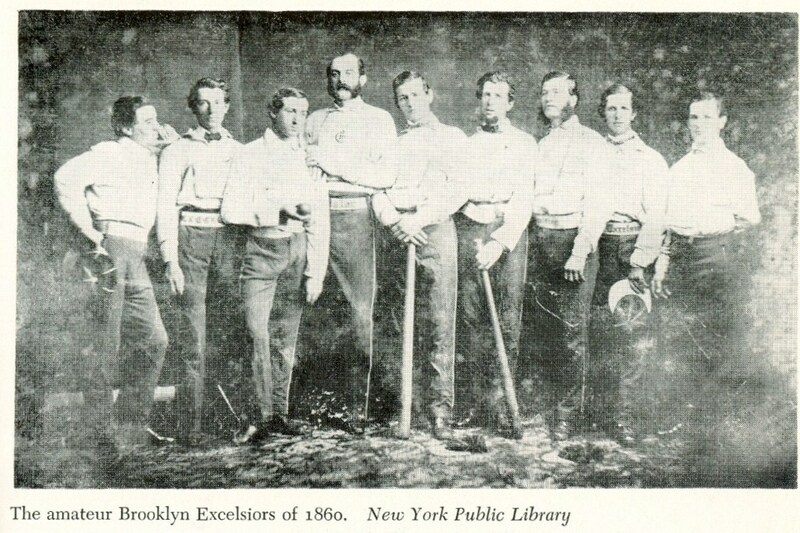 This photo of the 1860 Excelsiors with Creighton (third from left) was once part of the NYPL's Spalding Collection but is missing. This silver-gelatin print of the original was taken at the NYPL in the 1920s and documents their ownership of it. The same photo appeared in a book by Robert Smith with a credit to Culver Pictures. It appears that this same photo (possibly re-touched with wash) was reproduced in Robert Smith’s 1973 book, The Illustrated History of Baseball with a credit to Culver Pictures. Culver is credited with several other photographs in Smith’s book that appear on the NYPL’s “Missing List” including: an 1859 photo of the Knickerbocker and Excelsior Ball Clubs; an 1882 photo of the Providence BBC; and an 1889 photo of the Chicago and All-American teams. Could the “Culver Creighton” have once been part of the Spalding Collection and once removed from Henry Chadwick’s scrapbook? If it was stolen, short of an actual confession from the thief, we may never know where the Creighton card originated from. The recently discovered copy at the NYPL was owned by Chadwick and a third known existing copy of the Creighton photo also belonged to Chadwick at one time. 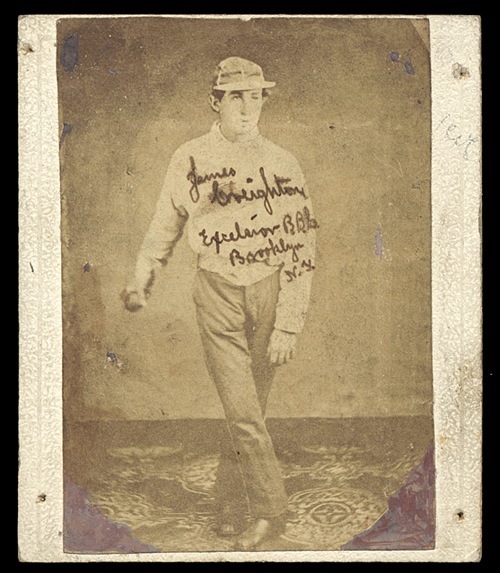 That copy, featuring Chadwick’s handwriting on the photograph identifying Creighton, was found among the belongings of baseball writer and historian Charles W. Mears. 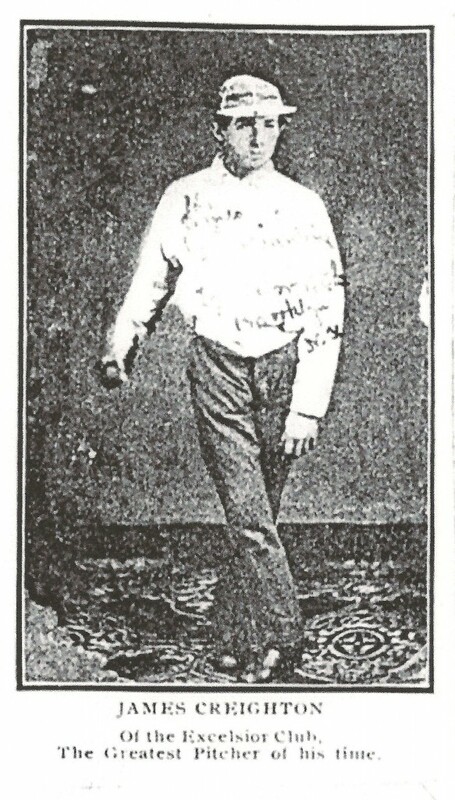 The third known copy of the Creighton photo was found amongst the belongings of baseball historian Charles Mears after his death. His card is inscribed in the hand of Henry Chadwick as was another card he retained featuring the 1868 Atlantic team. Two years after his death in 1944, his collection was donated to the Cleveland Public Library but, for unknown reasons, held back were the Creighton photo; an 1868 Brooklyn Atlantics photo (also inscribed by Chadwick) and an 1869 Peck and Snyder trade card of the Cincinnati Red Stockings. 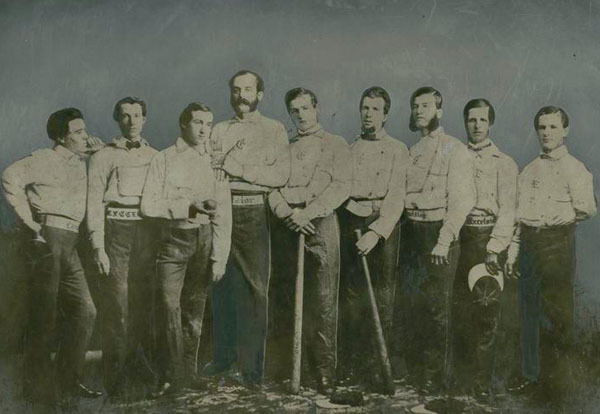 In 2009, Mears’ grandaughter, Charlotte Walbert, wrote into the ScrippsNews memorabilia column, “Ask Babe,” to find out the value of Mears’ 1868 Brooklyn Atlantics photo and his 1869 Peck & Snyder card of the Cincinnati Red Stockings. Walbert did not mention the Creighton card in that column. In 2010, the Creighton card was consigned to Robert Edward Auctions by Mears’ descendants and sold for over $18,000. The Mears copy of the Creighton photo is also the only example known to have ever been reproduced in a period publication. A scrapbook of Brooklyn Atlantics player Jack Chapman, at the Baseball Hall of Fame, features a clipped black and white news image of the Mears copy featuring Chadwick’s handwriting. It appears the image may have been reproduced in a magazine or supplement of the Brookyln Eagle at the turn-of-the-century. How did Mears acquire his copy of the Creighton photo and why wasn’t it included in his collection that ended up in the Cleveland Public Library? Why is the “Culver Creighton” mounted on what appears to be a trade card with graphics identifying the great Creighton? Could that photo have been an early product of Peck & Snyder and what year was it produced? Could it have once been mounted in Chadwick’s scrapbook at the NYPL? How did Henry Chadwick come across his unmounted Creighton (cdv-sized) photo to paste in his score-book? And where did the NYPL’s photograph of the 1860 Excelsiors and Creighton disappear to? Shrouded in considerable intrigue, one thing is for sure regarding the three surviving Creighton images; Jim Creighton’s untimely and tragic death solidified his legend in baseball lore and the rare cards featuring the frozen image of his underhanded delivery will, no doubt, remain a great hobby mystery for the ages. Great stuff, Peter. I always look forward to your posts. I hope you do another Greenwood Cemetery tour soon. Peter, you are a super-sleuth. Pete, HAULS OF SHAME is the hi-lite of my day. You are doing a superb service for all of us “cranks”. Cannot express how glad I am that this Creighton was overlooked by crooks! Hopefully someday it will be available for all of us to enjoy at the NYPL, as I’m sure was the wish of guys like Spalding and even old Henry back in the day when he took the time to assemble these magnificent scrapbooks. On the missing items, dont tell me Halper and Gutierez were there also, spooking around with slippery fingers ??? lets hope the library gets those treasures back.